Starting today and continuing until Christmas, this blog will be a Virtual Advent Calendar, with each day containing a recipe, homemade gift, decoration etc. to get us in the holiday mood. Hopefully, some of the posts will inspire you and bring you some cheer. 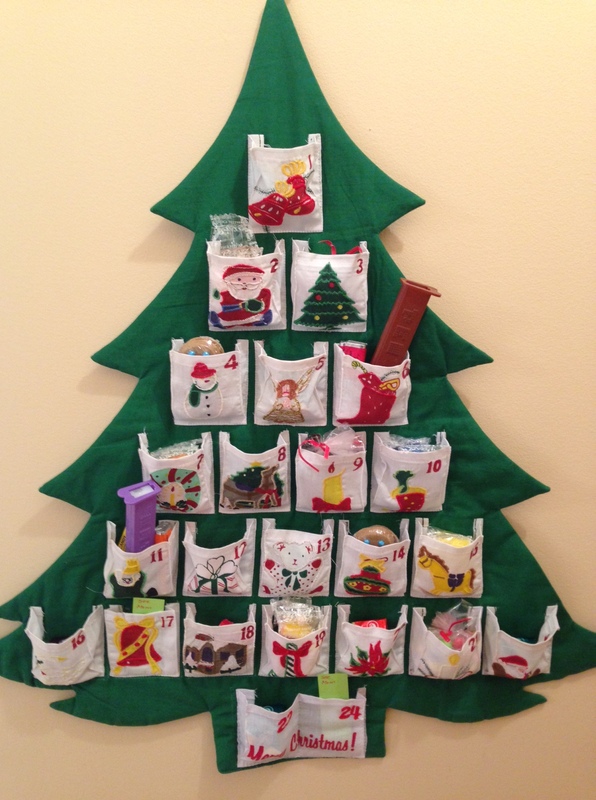 The Advent calendar in the photo has been in our family since shortly after our first child was born. One of my husband’s sisters sent it from Hong Kong, where she was living at the time. The pockets are large enough to hold treats for two children (whew) and it has been a pleasure and a thrill for me to fill it for the last 20 years. If a certain item didn’t fit, I just put in a note that said “See Mom for *” and they would turn it in for the treat. At one point, when the girls were in junior high, my husband asked at what age would I stop filling it for them. We looked at him in incomprehension. We decided his confused state must be caused by having gone too long between meals and promptly found him some beef jerky to revive him. We never plan to stop! When our eldest moved out two years ago, she got her own calendar which she takes pleasure in filling for her and her boyfriend, and to which I make small contributions. Our youngest asked if I would keep filling our calendar for two and share with her as it seemed “wrong” for her to do it alone. The girls always took turns as to who would remove the treats from the pocket each day and there was much discussion as to who would start December 1, as the other one would get to first discover what was in the Christmas Eve pocket, which was usually the largest gift. She enjoyed this ritual and didn’t want to stop. I now get double enjoyment: both filling the pockets, and sharing in the spoils! Ho HO!